1 The mockingbird is a very smart bird. Many birds have a single call, or song, that they sing. It is easy to tell what kind of bird you are hearing by its call. Mockingbirds are different. They can sing the songs of almost any bird that they hear. Mockingbirds love to sing. They can be some of the noisiest birds around. 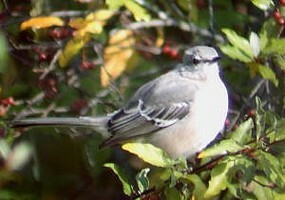 Mockingbirds may sing for most of the day in the spring or early summer. Sometimes mockingbirds even sing at night!